If you want to get better at photography, you can find a lot of free advice on the inter webs. Buy a new camera or lens, use new software, travel to an exotic location, take a workshop or a course, read books, study the masters, etc. My free advice isn’t any of the above and it won’t cost you as much money as some of those things will. And I don’t see it come up very often on-line. Take my advice and not only will you learn new things – you’ll be exposed to different genres of photography, and you’ll be able to practice what you’ve been exposed to. What’s the secret? Join your local camera club. The weather’s been gloomy around Central Florida recently. solid grey clouds, rain and drizzle, and not much light to make photographs with. So I was happy that there was a Still Life Event at the Orlando Camera Club meeting last Monday. They brought in interesting items to photograph and had tables, lighting, and backdrops to use for set up. I brought a camera, tripod and flash (although with my tripod, I ended up not needing the flash). It was a lot of fun to choose items and arrange compositions. It’s something I don’t usually do – but that’s a good thing. Here are three photos from that evening. Keb Mo blues – Playing around with compositing: I made the foreground shot of the guitar & Blues sign at the Still Life event. I added the background photo of Keb Mo that I made at his concert in the Plaza Theater in Orlando on Feb. 1 2012. I’m sure that wherever you are, there’s a camera club that you can join too. Update on the blog hosting change: It does look like the transition’s been successful. The email subscriptions seemed to go out ok last week and I haven’t received any problem reports. One issue I’m aware of is that the move appears to have broken RSS subscriptions. So If you’ve come here directly to find out why your Central Florida Photo Ops RSS feed isn’t working – I’m sorry. I don’t think I can do anything about it. You’ll have to re-subscribe. And finally, I’m sure you heard that Leonard Nimoy passed away on Friday and will be buried today. Of course I didn’t know him, but I felt I knew his famous Mr. Spock character that saved the day (and even the universe) so many times over the years. May he rest in peace. Thanks for stopping by and reading my blog. Now – go make some photos! And live long and prosper. The Pioneer Settlement for the Creative Arts in Barberville, Florida was founded in 1976. Lynn and I first went there when our kids were little – sometime in the 1980s. It’s grown a lot since then and the non-profit organization that runs it has kept it up and added many more buildings and displays than I remember. Three of us from the retired chapter of the Photography Interest Group went over on November 19th. The centerpiece of the campus is the original Barberville High School. The Schoolroom – This is in the Barberville Central High School, built in 1909. It was added to the National Register for Historic Places in 2002. The window light and the wooden floors and desks were lovely the morning we were there. The photos in this post are from just four of the buildings / displays that you can tour. There are 22 in all. I have photos of several more that I haven’t processed yet. As I finish them, I’ll add them to this Barberville set on Flickr. The store below was originally at the turpentine operation in Bakersburg, Florida. It was moved to Barberville in 1984. The H. L. Wynn Country Store – Get your insurance and your livestock feed, all in one place! The only building at Barberville that isn’t from Florida is the log cabin. It was built by Mr. Jim Lewis in 1875 in southern Georgia, and moved to Barberville in 1992. Log Cabin Porch – complete with laundry! The blacksmith’s shop was built in 1987. The Florida Artist Blacksmith Association uses it for their monthly meetings and to work on their projects. Tools of the trade – I love the huge bellows and the overwhelming number of tools available. Check out the Pioneer Village web site for much more information. They have many special events scheduled including their upcoming annual “Florida Christmas remembered”. I think it’s worth another visit back to see the decorations. Barberville is only about an hour from Orlando – right where SR 40 crosses US 17. It’s well worth the trip. If you have kids, they’ll like the exhibits, demonstrations, and animals. Adults will enjoy seeing how Floridians used to live. And as a photographer, it’s another “target rich environment”. We’ve kayaked at Crystal River before but wanted to explore the area a little more. So Lynn and I decided to take advantage of our long weekend and went back last Saturday. It was a very beautiful trip – relaxing, great scenery, and good weather too. We reserved two kayaks for 8:30am from the Crystal River Kayak Company and were on the water before most of the crowd got there. The canals in the area can be pretty. Sometimes it takes a while to position my kayak for a photo and Lynn gets pretty far ahead. In the winter months, manatees are all over this area although we didn’t see any on this trip. It’s warmed up so much they’ve moved on. If you’re planning to kayak here, it’s best to go early in the day. We drove by later and the water was very crowded – not at all like what we experienced the first thing in the morning. The hotel where we stayed was right on the water, so I was hoping for a good sunrise or sunset view, but was disappointed. There weren’t any good sight lines east or west and even though we drove around a bit looking, we couldn’t find a spot close by. I’ll have to do more research before our next trip. One view from the water by our hotel. I wanted to show the sailboats and reflections against the sky. It was about 30 minutes before dawn, and so dark that it took me a few tries to frame the image the way I wanted. The sky colors were a bonus – I couldn’t see them at the time. I was lucky the water was calm and the boats didn’t move during the 6 second exposure. In addition to the kayaking and relaxing, we also had several good meals and especially liked Charlie’s Fish House. There’s lots to do in the area too. We enjoyed stops at Weeki Wachee Springs State Park on the way over, and Micanopy and Marjorie Kinnan Rawlings Historic State Park on the way back. 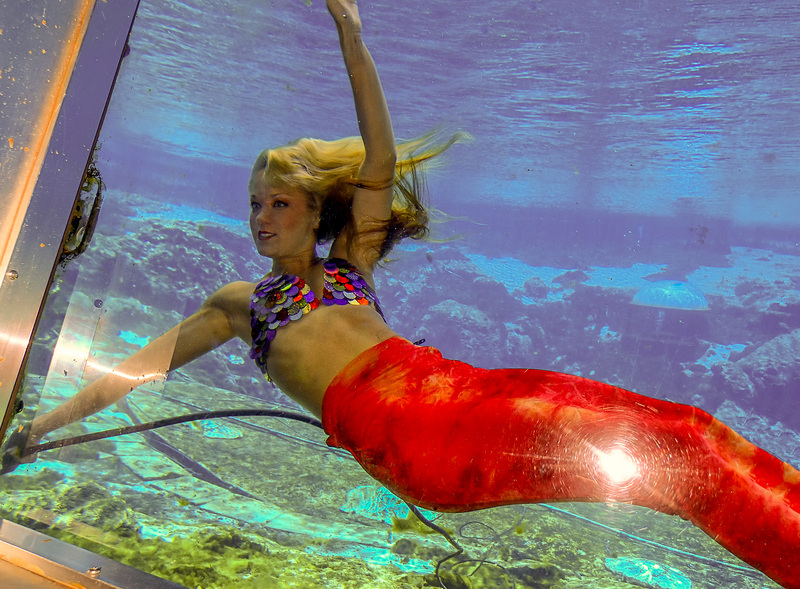 Weeki Wachee State Park has a live mermaid show, a glass bottom boat ride, a water park and canoe / kayak rentals. It was crowded when we stopped. We saw the mermaid show, but the line for the boat ride was over an hour long. At the corner of Cholakka Blvd. and Seminary Avenue, Micanopy, Florida. Micanopy is a good place to look for antiques and photograph historic buildings in an “old Florida” setting. 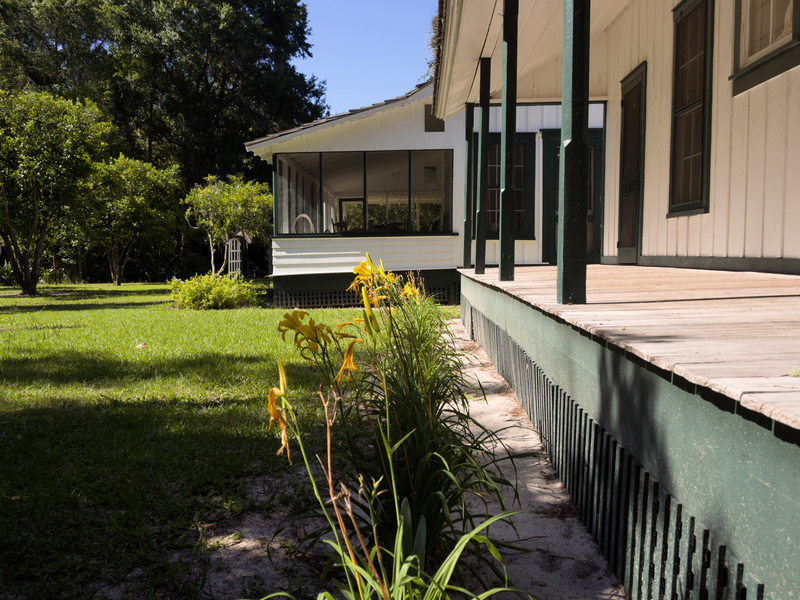 The farmhouse at Marjorie Kinnan Rawlings Historic State Park in Cross Creek, Florida. She wrote her books on the screened porch. We had a great trip, but it was too short. There’s way more to see and do in this area and it won’t all fit into a single weekend. We might have to schedule another visit soon. You can see a few more photos from Crystal River in this set on Flickr.